From Little Rock, it’s a straight shot on US 65 South to Lake Village, Arkansas, along an entirely flat highway lined with farmland as far as the eye can see. This is the route people take, mostly just passing through, to Louisiana, Mississippi, Alabama and Florida, but, for those who know, there is one place to stop: Paul Michael Company, a 30,000-SF shopping destination filled with beautiful furnishings, fine handcrafted pieces, antique rugs and original art. In addition to the flagship Lake Village store, founded in 1993, there are stores in Lafayette and Monroe, Louisiana, and Canton, Texas. Paul got his start selling jewelry at Canton Trade Days. His wife Debbie tells the story of how that came to be. It was on this journey that Paul was inspired to make and sell his own jewelry, which he would sell or trade for other pieces and take it all to Canton Trade Days. Years later, at the height of his jewelry business, Paul was selling sterling silver jewelry to Dillard’s, Nordstrom and Macy’s in more than 700 stores. Paul and Debbie met in Nashville, Tennessee, where she owned Betty Boop’s, one of the first vintage clothing stores in the country. 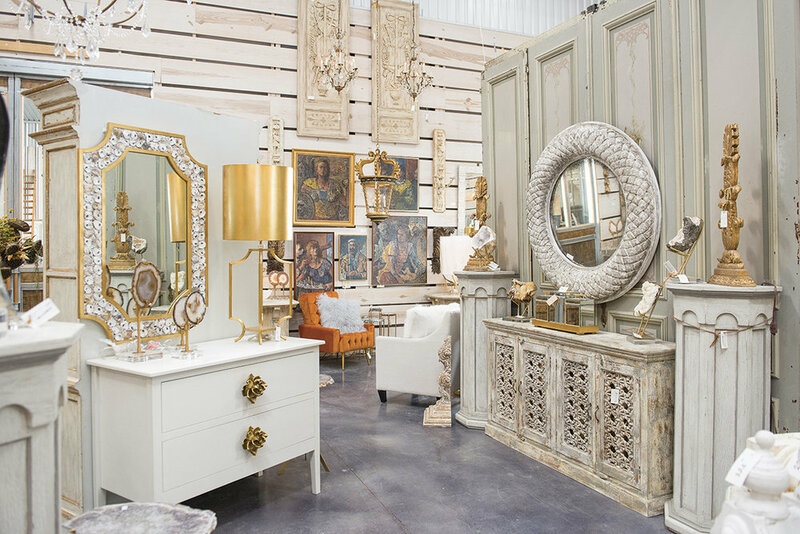 Sharing a love of antiquing, the couple formed a bond and eventually a business. 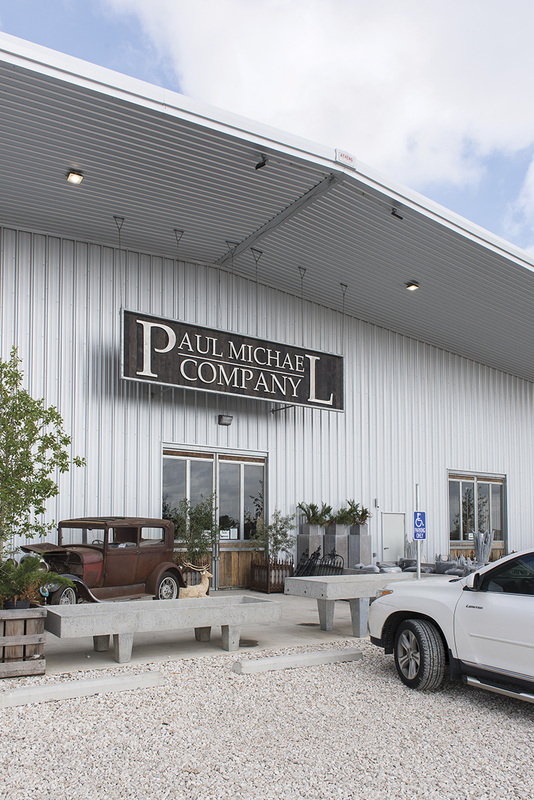 Paul Michael Company will celebrate its 25th anniversary this year. In Paul’s world, his principles are reclaim, reuse, recycle and redecorate. It was important to him to do something that separated Paul Michael Company from other businesses. This was the inspiration for Paul Michael Exclusives – 100% American made pieces constructed of mostly architectural salvage and reclaimed wood that Paul has been collecting for years. In Dermott, Arkansas, the woodshop is open seven days a week, developing, manufacturing and designing original pieces. Paul believes everybody is creative; they just need an opportunity to explore and express it. This is the place where that happens. Paul Michael Company’s newest creative endeavor is Market Hill in Round Top, Texas, the 130,000-SF space with seven buildings under one roof, including a restaurant. “Shopping Round Top, it occurred to Paul that the simple logistics of picking up the stuff you bought, the difficulties for the antique dealers setting up, and lack of clean restrooms, led him down the path to creating Market Hill,” she says. “Something as simple as a way for [vendors] to hang a chandelier, designing a building to have the ability to use an 18-wheeler to transport their merchandise to the market, and more importantly a controlled environment for their customers to shop in comfort,” Debbie says, are the things that make Market Hill unique and attractive for vendors and shoppers alike. Come meet the man and woman behind Market Hill, Paul and Debbie Michael. For more, visit paulmichaelcompany.com.